clean out the fridge challenge “stew” ! My blog friend Dolly Rubiano has challenged me and mumandleahcook to a little clean out the fridge recipe posting. How fun! Well, this did present a challenge for me because, you see, it is a bit rare for me to over purchase at the market. I am very precise when it come to shopping and using everything I bring home. I always have the regular items such as, milk, eggs, cheeses, a little lettuce of some sort, and usually a few beers and maybe some chilled wine. What do you do with all that? I could make a salad and put an egg on it! I already posted that here. I stood at the refrigerator looking at some carrots and two large parsnips. Then I knew I had to raid the freezer too. Again, I do not usually have too much stored in our freezer, typically buy fresh and use right away. I did have some stewing beef. I decided then I would make a beef stew, smashed potatoes and caramelized parsnips. 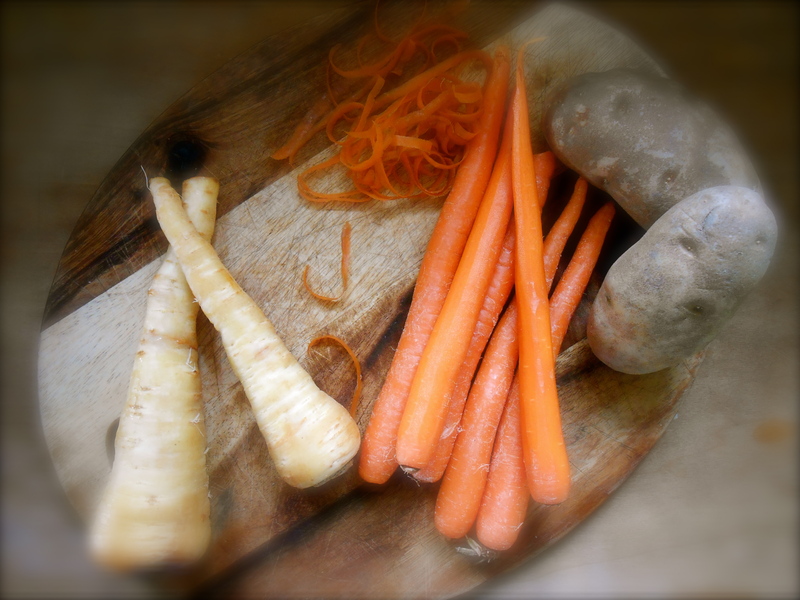 I had brought the carrots and parsnips home a few weeks ago thinking I would use them in a soup. I have to admit I did have to peel them, they were looking a little “over ripe”. This caramelized parsnip recipe is like eating a delicious coconut! Not much in the fridge! Heat the oil in a large heavy pot. Add the beef and brown it over high heat until it is nice and brown on all sides. Salt the beef as you go. Add the onions and fry until it has softened. Add the butter, garlic and thyme and cook until butter is melted and the garlic is aromatic. Add the wine, cook until it has evaporated and add the tomato sauce. Stir well. Add 3 cups of boiling water, cover, turn the heat to low and simmer for 2 -3 hours stirring occasionally. The meat should be very soft and tender after 2 – 3 hours. Thirty minutes before you are ready to serve add the carrots, cook uncovered until tender. Sauce should be fairly thickened when done. Turn off heat and allow to sit 10 minutes before serving. Place cut parsnips in a baking dish, drizzle melted butter and sugar on top. Toss to mix well. Add snipped chives and a little sprinkling of salt, cover with foil and bake for 20-30 minutes until tender. My “clean out the fridge” dinner was fantastic! It helped that it was 50° and raining all day so when the stew was simmering the aroma was as good as a warm blanket. I was very happy to top the dish off with fresh herbs from my garden. 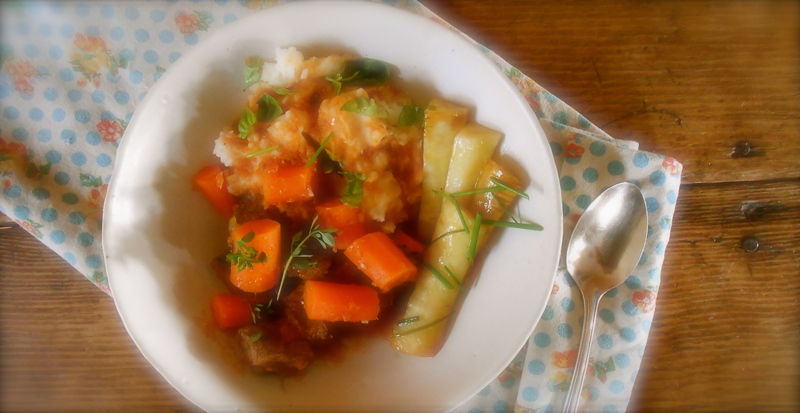 Basil on the smashed potatoes, chives on the the parsnips and thyme on the stew. Thank you Dolly and Sandra for a fun little blogging experience! § 46 Responses to clean out the fridge challenge “stew” ! This looks absolutely delicious, my style of cold weather comfort. Isn’t it satisfying to make delicious food from so little. I really enjoyed the challenge Seana, thanks for the kitchen fun! It was fun! Let’s do it again sometime! Your caramelized parsnips makes me drool (please excuse my lack of table manners)! I knew this is going to be a challenge for you because you usually cook with the freshest ingredients. But you did well with your stew! Thanks for joining in the fun challenge once again! I love your spirit of fun and creativity Dolly! Thank you for including me in the challenge! I can not get over your photography. Well, and your kitchen skills are quite good too. You have some wonderful gifts and I hope you continue to post for the world to see. Did you see Sandra’s post? Amazing! Really? Today we do have some “sun breaks” and it’s finally 70°! We always ease into summer over here. Such a fun idea – I love what you came up with and your photos are so lovely. I need to clean out the fridge so I’ll have to see what inspires me! Very impressed that this wasn’t planned. Sounds delicious. Perfect for any evening here by the coast as temperatures are never very warm, even in summer. And love those caramelised parsnips! You know…it’s never very warm here in the Pacific Northwest either. I can make soups in the summer months. Certainly pleases me. This is a great strategy. It is when I get the most creative. Look in the refrigerator and see what will spoil in the next day or so and see what kind of dish I can pull together. I have to remember to write down what I did, if the family likes it ,so I can recreate it. Your dish looks like one of those memorable creations. Thank you Jovina! I need to do this more often. This was a good reminder of the foods I sometimes throw into the compost because I just didn’t catch it in time. This looks delicious, aren’t these throw together dishes the most enjoyable… I think its the pride of putting something together from what we thought was nothing. Thanks for sharing. I agree. I love throw together dishes. Put the recipe aside and just cook! I love a good stew and that you were able to just throw this together is amazing. Love, too, that you caramelized the parsnips. What a great way to bring out their flavor! Thank you for your kind comment! 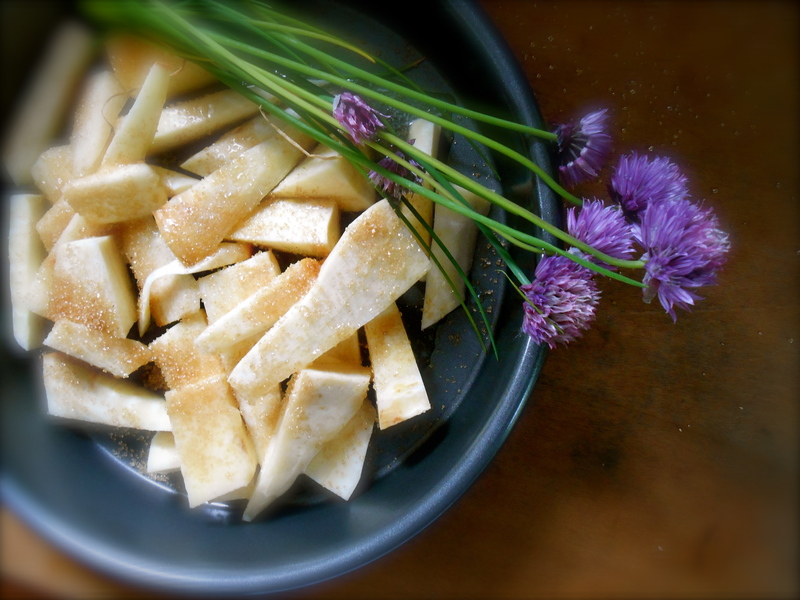 The parsnips were so nutty…almost like a creamy coconut flavor. So good. I love stew too! We could swap fridges – same things in yours as mine. Sometimes I get down to eggs, white wine, beer, and olives. Oh and cheese. Always cheese! Also went to the market today! Local cheese, sassy organic greens, ground goat meat, and homemade dried liver for the dog! Wow! impressive. :) Mine not so “exotic”. You will be posting what it is you are going to do with the goat meat…right? that’s a good idea! ;) Although not sure sure how many people have access to goat. This is ground. I use it to make burgers. They are the best burgers ever. Have you had it? It tastes a bit like lamb and it’s very low cholesterol, and incredibly tasty. Well then in that case, I’ll definitely do it. And thanks. I am loving your blog by the way – everything about it – from your blog title to your posts. I think we are sympatico…. I’m leaving London until next January, so I’ll definitely have to do this soon—except with the whole pantry! Hahah, that will be quite the adventure. The sound of those caramelised parsnips sounds amazing… they’re already sweet by nature, so I can just imagine how good they are after caramelisation. And I can just imagine how you would photograph them! :) Hope your travels are well…where ever you are headed. Necessity is the mother of invention! Great Recipe. One of my favorite TV shows is Chopped on Food Network. Have you seen it? They get a basket of mystery ingredients and have 20 minutes to prepare something for the judges. It’s a kick! No! I haven’t seen it but it sounds so fun! I’ll look for it. Thank you! Wouldn’t that be fun to do just within your own household? I have a 15 year old son and he would probably enjoy presenting me with mystery ingredients or visa versa…I give him some ingredients and see what he can do with it! I watch chopped all the time, the contestants always feel they were unfairly chopped, I never met one that admitted he/she was rightfully chopped. The last one I watched, a repeat, I think, someone cut his finger at the last minute. His tasty sauce was served on the plate but the food didn’t make it to the plate so he was chopped….although he was a strong contestant. Great show! Rosé wine, that is interesting, I have never heard of a recipe with rosé! That is so funny you noticed that! Normally I would use a red wine in stew but all I had was rosé so I went ahead and wrote it into the recipe! That is very honest. Did it change the taste? Verdict: clean out dinner was successful and after reading the narration I can taste it from right here where I am sitting. I still envy the fact that you have a herb garden, sigh…. The caramelized parsnips, bubbling in butter, some turbinado and chives, one of my favourite herbs, I can taste it. I like your blog because there are no additives in cooking, when I want to eat food without too many additives, I know where to go. Thanks for sharing and thanks for always popping by. I hope you have a wonderful week, full of laughter and happiness!!! You know I was still hoovering around your blog looking at recipes. I have to go know and answer my comments etc. Have a pleasant evening. I can see we are three hours ahead of you! With not much in your fridge, you managed to make a delicious-looking meal! How clever of you! Don’t you just love those clean out the fridge meals? They make the best kind of meals. This looks just delicious! Great ideas. I do a clean out the fridge meal every Monday. That is a great day to do it! After the weekend of cooking and whatnot. Ha! I’ll have to take a look. :) Thank you for visiting! You are currently reading clean out the fridge challenge “stew” ! at COTTAGE GROVE HOUSE.